The Advantage Touch Advance is an AC/DC color touch screen charger with incredible features: thanks to the integrated 100W power supply charge currents of up to 10 Amps are possible to fast charge your batteries (1-6S LiPo/LiFe/LiIon, 1-15C NiMH/NiCd, 2-20V Pb). On this charger six language packs are already pre-installed (English, Japanese, French, Italian, German, Swedish). At the first start-up you choose your preferred language, continue with the innovative charge assistant and your charger is ready to charge, discharge, store, balance, cylce or show you the latest charge data – all this with one single click! During the last year the ATTS touch screen software has been continuously improved: the balancing process could be adapted in a way to be faster and more precise. Like this we could reduce overall charge time. Furthermore the graphics engine has been optimized with a better auto-zoom. Another feature is that you can personalize your charger with your own theme color. The Touch Advance is equipped with the latest software with all those and even more new features. You can test the charger online! Of course we also integrated a USB-connector to provide you with the latest updates and features through the year. With the software which you can download on our website for free you will even be able to monitor your charge with a PC! Our Touch chargers are probably the most complete chargers available today. We include 7 different charge leads with EC3, Deans®, Tamiya®, TRX®, BEC, Futaba® plugs and crocodile clips. You will also find our 4-in-1 balancing board, a Micro-USB cable, the mains power cord, a quick start manual and instruction guide in the box. 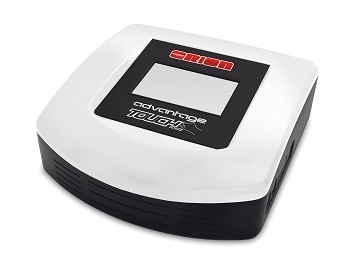 The Advantage Touch Advance is built around a modern microprocessor and secured with the Multi-Protection System against input/output reverse polarity.